Where are the TIFF Box Offices? Looking for tickets for the Toronto International Film Festival, or one of the other film festivals or events TIFF puts on throughout the year? There are a few ways to go about it. TIFF aims to showcase the best in both Canadian and international film throughout the year, and in addition to the Toronto International Film Festival, they run TIFF Kids, Next Wave, Canada's Top Ten, , and many more screenings, festivals and talks. So how do you get tickets? Read on to find out. The easiest means of getting tickets to TIFF or related events is doing so online or via the TIFF app. Your first step is to research the movies that will be playing and making a list of what you are hoping to see. You won't always get your first (or even second) choice, but having an idea of your options in advance can help make the process easier. Then, get tickets from any film or event page on the website or via the App by clicking on a time for the film you're interested in and then following the prompts to make your purchase. Alternatively, you can sign up for and then go straight to your TIFF Account Manager and grab tickets from there. The next step is to either print your ticket at home, save it to your mobile phone, or pick up at the box office, with the easiest and most convenient options being printing at home or saving to your mobile phone. For the Toronto International Film Festival specifically, figuring out the ticketing system can seem complicated since there are various packages and ticketing tiers to sift through, but you can make things easier by reading through the various pricing and ticket options on the tickets and packages page of the TIFF website in advance of making any purchases. This is also where you will find key dates to keep in mind for when you are able to start trying to obtain tickets. Make sure to double check your screening time and date as schedules can change. You can check regularly at tiff.net or on the TIFF App. Or, get a full list of schedule changes at tiff.net/changes during the Festival. If you have any questions during the festival, volunteers are usually on hand at venues, box offices and at lineups in order to provide festival-goers with any assistance they might need. Be flexible. Just because you didn't snag tickets your top choice, doesn't mean you won't have a good time. The TIFF program is so varied that you're very likely to end up seeing something thought-provoking no matter which film(s) you end up at. Most films do not have assigned seating so it's very important to show up early, ideally one hour before your film begins. According to the TIFF website, 15 minutes early is on time. 5 minutes early is late - so plan accordingly. The Toronto International Film Festival and and any other related screenings and festivals are run by TIFF, which has a year-round box office in TIFF Bell Lightbox, a building occupying an entire city block in downtown Toronto. TIFF Bell Lightbox doesn't just show films, they also host events and film-related installations and exhibitions, so there's almost always something going on there that's worth a peek for film fans and movie buffs. You can find TIFF Bell Lightbox at 350 King Street West in Reitman Square, on the north-west corner of King Street West and John Street. 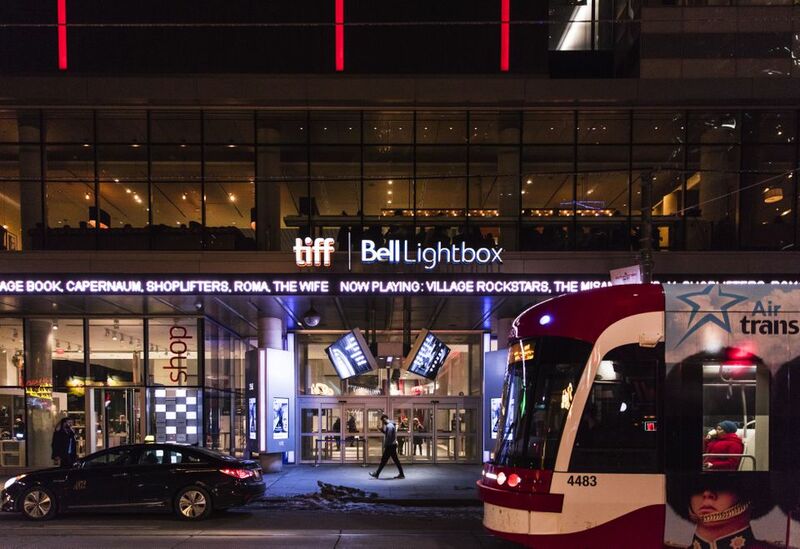 The TIFF Bell Lightbox box office is open from 10am to 10pm daily. During the Toronto International Film Festival there is a box office located at 225 King Street West from which tickets can be picked for various screenings if you didn't print them at home or save them to your phone. In addition to Bell Lightbox, other TIFF venues include Roy Thomson Hall, Princess of Wales Theatre, Ryerson Theater and Scotiabank Theater among others. If you want to know more about TIFF Bell Lightbox any time of year, there are free weekly tours available if you're interested in the building's history and architecture. Tours last around 45 minutes. If you're in the area (for TIFF or a tour), there are lots of restaurants and bars close by, including Canteen and Luma Restaurant, which can both be found inside TIFF Bell Lightbox. Head to Luma after 4pm Monday to Saturday for their happy hour specials (dubbed "Magic Hour") where you can get $6 martinis, manhattans and grolsch lager pints.